No matter what we may call our music these days, “alternative,” “indie,” “noise rock,” if you look at it squarely and say there are no real rock and roll bands anymore, you’re not really wrong. Oh sure, we’ve got poetic, dreamy dudes like Band Of Horses and The Kooks, we have arena rock and its big-drum anthems of alienation from the likes of U2. But where, you may ask, are the fast, noisy guys, who come into the house, eat your food, steal your silver, wipe their noses on your curtains and don’t even apologize. I mean this symbolically, of course. But I gather The Ramones use to really do this. Still, where are the boys who roll as well as rock? I think I know. And if you’ve been paying attention to the underground scene, you probably do, too. They are here, and they are called by the name Deer Tick. Not to be confused with Deerhoof, Deerhunter or The Dears. This Rhode Island aggregation, comprising John McCauley III and a revolving cast of characters, has been honing their craft in relative secrecy. And it has paid off. Their new album is everything we like about rock and roll. It’s up-tempo, irreverent, silly when it needs to be, grave when it must be. 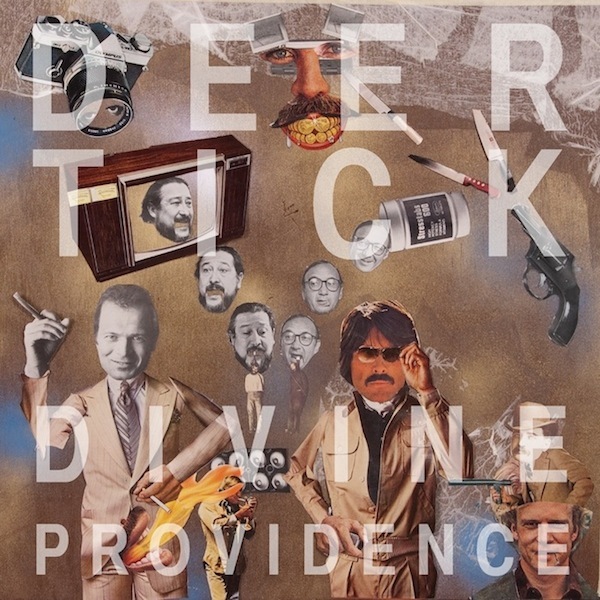 Deer Tick calls their new one Divine Providence. And it actually is, for all the real rockers out there who have felt like agnostics or – God forbid – atheists for far too long. Starting with the opener, “The Bump,” this divine and messy band brings the music and the mission statement. “We’re full grown men/But we act like kids,” growls McCauley over what sounds like The Replacements at their drunkest and most inspired. And from here on in, things get more desperate, more chaotic and, yes, groovier. “Funny Word” combines an intense, stomping beat with enough AOR polish to attract radio play. It also sports a typically edgy McCauley vocal, followed closely by a Chuck Berry-style guitar, all the while pledging allegiance to Creedence’s “Sweet Hitchhiker.” The off-the-wall humor and irreverence also owe something to NRBQ’s knockabout approach to rock. When was the last time you heard anybody mention them as an influence? As with any hard rocking band worth their salt-lick, Deer Tick can slay you with the ballads, too. “Chevy Express,” all ominous synths and funeral-march drums, is a spooky small town story about hatred, murder and – God help us – whatever comes next. McCauley’s lines about “mother nature waging a war,” although written before Hurricane Irene, will also mark the songwriter as some sort of sage. The amorphous and unnamed fear in this song lingers long after the track is over. Something you can say about the entire album. Then there’s “Something To Brag About,” one of the best out-of-control rockers since the heyday of The New York Dolls or The Stones. Nothing here sticks around long enough to wear out its welcome, however. The songs arrive, get you all jazzed and leave before you’ve even found out their names. Just like any provocative house guest you hope to see again. If this sounds like a rave, then you read it correctly. Divine Providence, music that the Creator Himself may have sent, is the best, funniest, most detailed, thrilling blast of rock and roll since The Hold Steady’s Boys And Girls In America. It’ll have you dancing while you’re thinking about the lyrics and positing all kinds of intellectual theories as you listen to its very danceable grooves. In fact, you won’t know which one to do first. And the coolest thing? You will not care.